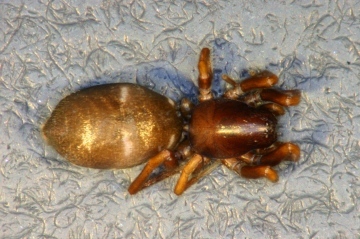 I reported the first find of Micaria alpina (Gnaphosidae) from Scotland in Newsletter 45. Subsequently, I have discovered three further males of this species in material from a pitfall trap and water bowls from An Teallach, a mountain in Ross & Cromarty. The traps were in operation between 7th May and 17th June 1984 on Glas Mheall Liath, a spur of An Teallach, on a south-facing and moderately steep slope and at an altitude of 890m (Nat. Grid Ref. NH 073840). The vegetation there is a mixture of Mat-grass (Nardus stricta) and woolly-fringe moss (Racomitrium lanuginosum). An Teallach is about 100 km north and 35 km west of Creag Meagaidh in Invernessshire where I first trapped M. alpina. Added by John Partridge at 20:06 on Tue 10th Jan 2012. The only previous British records for this rare gnaphosid are from two Welsh mountains. In 1983 I captured 13 males and 3 females of this spider on the south-facing slopes of An Cearcallach, Creag Meagaidh, Invernessshire. The specimens were taken in pitfall traps and waterbowls, which were set up on 16th May, emptied and re-set on 18th June, and finally emptied on 10th July. One male was taken between 16th May and 18th June, while the remainder of the specimens were taken between 18th June and 10th July. The habitats and localities were as follows: 7 specimens in bilberry (Vaccinium myrtillus) heath and scree (Nat. Grid Ref. NN 422849, altitude 760m); 1 specimen in tufted hair-grass (Deschampsia caespitosa) grassland (Nat. Grid Ref. NN 416851, altitude 790m); 8 specimens in woolly-fringe moss (Racomitrium lanuginosum) heath and scree (Nat Grid Ref. NN 419852, altitude 885m). The females are the first known to have been taken in Britain (Dr Peter Merrett, pers. comm. ).